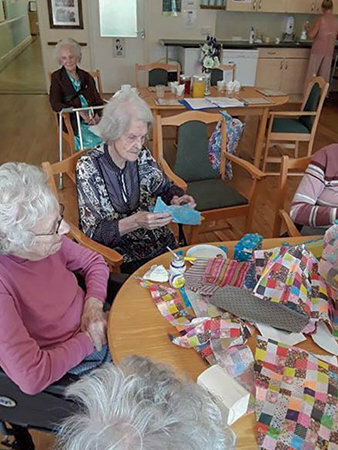 Residents at Humfrey Lodge residential care home regularly enjoy arts and crafts sessions held by Trudie Tagart whose mother, Hazel, is a resident at the home. 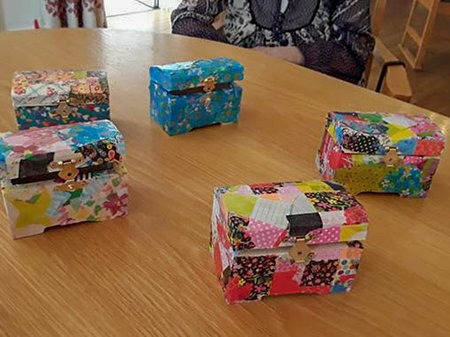 Residents have taken pleasure and pride in making Christmas decoration, jewellery and most recently they have designed their own trinket boxes. This is a creative and fun group activity for our Humfrey Lodge residents. 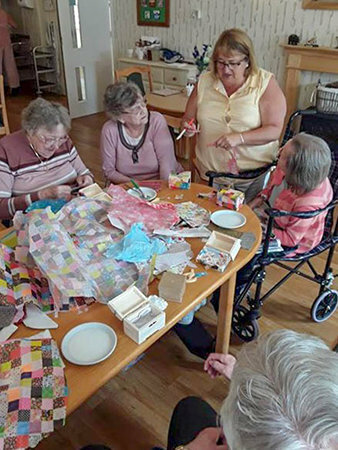 Working together within a in group encourages interaction as well as concentration on the crafting activity, resulting in a true sense of achievement; all of these factors contribute to the wellbeing of our residents. Humfrey Lodge is a 48 bedroom care home in Thaxted, Essex, halfway between Saffron Walden and Great Dunmow. This Thaxted care home caters for 24 hour expert care for older people, including those living with dementia. For more information please call Humfrey Lodge on 01371 830878 or email humfrey.lodge@runwoodhomes.co.uk. Visit the Humfrey Lodge web page by clicking here.